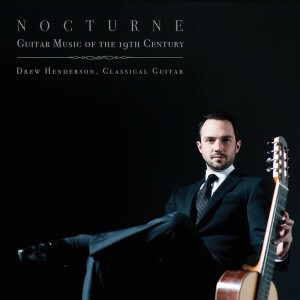 If you follow this site then you’ve already seen Canadian guitarist Drew Henderson’s videos and you know he’s fantastic. Therefore, I have little to criticize on this well played and recorded album. I first became aware of him through his excellent work in the Henderson-Kolk duo along with his friend and colleague Michael Kolk. The virtuosic young duo has made big waves but Drew has continued to work on his solo career winning competitions and recording albums. On top of all this he’s a great video and sound producer and has recorded some top notch Youtube videos both of himself and others. The album is filled with some of the greatest works of the 19th Century including the wonderful Op. 19 and 23 by Regondi. Henderson pulls off all the beautiful tremolo in the Reverie with refined style. The sweeping scale passages and virtuosic little motifs of the Caprice are played with ease and all the impressive showiness required of Regondi’s works. Henderson also has great articulations throughout the Caprice as well as some nice space and rubato. Fantastic. I must admit that I don’t know the works Coste very well but Les soirées d’Auteuil seems to be one of his gems. It has more depth and content than I expected from Coste and Henderson plays it with determination – impressive as Coste does meander a little in his compositional style. Some nice colouration/orchestration in this one. If anything, listen to Coste as an excellent example of writing for the guitar in this style. The Legnani Caprices are up on his YouTube with live recordings so you can also check them out there. Virtuosity aside, there are some really nice moments in these works. They are not all frill and trill… That’s the good thing about Henderson’s playing, he combines solid musicality and showmanship so neither suffer because of the other. Henderson’s performance of the Paganini is bar none. There is a straight-forward but musical approach which I appreciate. I grew up listening to Bream do weird and strange things to this work (still love the Bream) but I’m glad to have nice recording of this work with everything done right. Lots of nice crisp lines and refined arpeggio textures. In all honesty, I’m a bit sick of this work but Henderson’s fine playing reminded me of the work’s charm when not overplayed. The sound quality is great on this album. It’s very clear but never harsh. I wouldn’t call it lush but instead bell-like and glassy with a sweetness around the upper end which saves it from being too bright. Its an excellent example of good modern recording. Lots of natural reverb, although I thought might have heard some additional added reverb which mixed strangely at the beginning of Regondi’s Op. 23 (I could be wrong – I’m reaching to find anything but positive remarks). It was recorded at the Church of St. Mary Magdalene, Toronto. All recorded and edited by Henderson himself. Rare to have a player who doubles equally good in recording (a nice combo to have!). Drew Henderson is one of Canada’s finest classical guitarists. Henderson perfectly matches solid musicality with virtuosic showmanship on this varied programme of quintessential nineteenth century repertoire. With the moving Regondi, delightful Coste, and the dazzling Legnani and Paganini, this album will be enjoyed by general listeners and guitarists alike.